Good ASL Habits to Develop - SignOn - Connect. Practice. Retain. 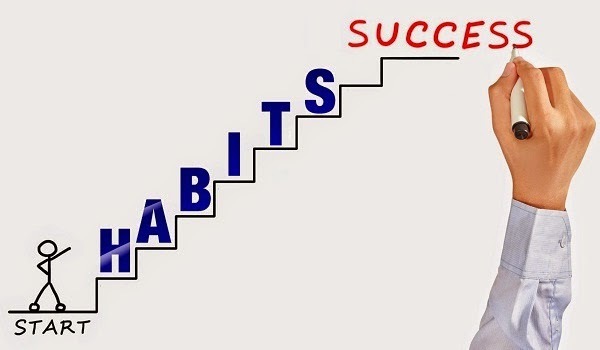 Everyone knows that when learning something new that it’s a good idea to start off right as habits are hard to break and it takes longer to relearn the “proper” habit. If you made a fingerspelling or sign mistake it’s often a habit to “erase” it with your hand (waving in the air). Don’t do this, instead just pause or shake your head no and start again, or sign MISTAKE and continue again. Another habit to avoid is while fingerspelling, don’t sign “J” backwards (so it looks reversed), and signing “Z” with the little finger instead of the first finger. Avoid the tendency to “bounce” your double letters, they’re supposed to “slide” a bit. To help lessen the confusion between common letters like D and F, or S and A. A helpful reminder is that D comes first before F in the alphabet, so hold up your first finger up to form D. As for the difference between S & A, just think the word “fist” has an S in it – so make a fist for S.
When watching a conversation watch the face or the whole upper body rather than concentrate on the hands. If you concentrate only on the hands, you miss other clues like negation, facial expressions and such. Beginner signers are often confused by a Deaf person signing to and looking at an empty space. Stop the impulse to see if that person is really there. In ASL this is establishing “role taking”, which is the same as saying “he said” and “she said” before quoting. Sometimes a Deaf person will momentarily look elsewhere as they’re thinking of something else to say. This prevents the other person from taking their turn to talk. Many Deaf do mouth many of the words they sign. The right time for mouthing these depends on numerous factors. Some of those factors have to do with whether or not a sign is traditionally done with a specific mouth morpheme (for example: NOT-YET uses a slightly open mouth showing the tongue covering the lower teeth). Many Hearing signers mouth inappropriately by either overexaggerating their mouth movements, or mouthing English words while doing signs that require specific mouth morphemes. So, try and avoid this habit. If you need to walk between two Deaf people chatting (like in a hallway). Just walk through at your normal pace and sign “EXC– USE” a few times. Ducking down and walking underneath as not to interrupt the signing is much more distracting. You should use your non-dominant hand as a “partner hand” for signs in which both hands move, and as a “base” (steady) hand for two-handed signs in which only the dominant hand moves, such as in indexing. Avoid “switching” back and forth between hands as it becomes confusing. Please recognize your limit in your ASL skills. Do not claim to be fluent if you’re under two years of signing experience. Too often Deaf people share stories of various people coming up to them and say “I know ASL” when in fact they only can fingerspell or aren’t past Level 1. The same thing goes for the urge to go and interpret for a Deaf person in public, such as seeing a Deaf person ordering at a counter. Keep these habits in mind during your journey in ASL and you’ll be off to a great start.